The news that Iceberg lettuces are being rationed in the UK, due to supply shortages, has made me ponder the nature of salad. When I was growing up, salad was Iceberg lettuce, sliced tomatoes and cucumber. I didn’t eat salad. Fortunately for me, my definition of salad expanded as I got older, and now I no longer have to say that I don’t eat salad. I do, however, avoid the traditional salad garnishes you get in restaurants – the year-round offering of lettuce, tomato and cucumber with a smattering of raw onion. But what counts as a salad? 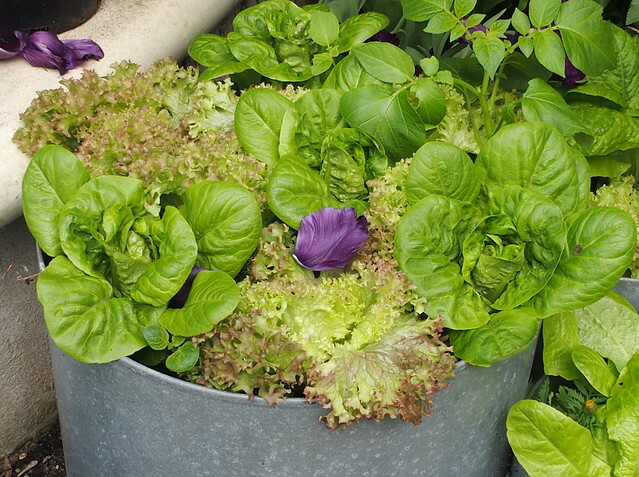 From a gardener’s perspective, salad vegetables are those that can be eaten raw. The growth in baby leaves has really expanded that range in the last few decades (for which we owe good deal of thanks to Joy Larkcom). It’s often only leaves that earn the epithet ‘salad’, but we know we can add other raw vegetables, sliced or grated or in their juvenile state. So salad is raw. Except, it isn’t. You can add cooked vegetables to salads. But it’s served cold, right? Well… mostly, but you can get warm salads. A salad is a dish consisting of a mixture of small pieces of food, which may be mixed with a sauce or salad dressing. They are typically served cold. Salads may contain vegetables, fruits, cheese, cooked meat, eggs, grains and nuts. It seems as though salad is one of those concepts that is very hard to describe, but understood by everyone in a very human, fuzzy logic kind of way. I thought perhaps that an expert on food might have a definitive opinion, so I sought out Harold McGee’s ‘McGee on Food & Cooking’, an encyclopedia of kitchen science, history and culture. Disappointingly, it doesn’t have a definition of salad. But it does have some fascinating historical insights. For example, it tells us that the ancient Greeks were fond of lettuce, and the Romans served it at both the beginning and end of meals. The Iceberg lettuce was crisphead lettuce until the 1930s, when the poor things were shipped all over America by rail, buried in ice. Before that, people had to rely on what was grown locally, whether in gardens or on farms. The 2017 veg ‘crisis’ started with courgettes, moved onto Iceberg lettuces and broccoli and is likely to mean shortages of tomatoes, peppers and celery over the next few weeks. As many people have pointed out, this is a bit of a First World Problem. No one is going to starve, or even suffer a serious deficiency, if they can’t eat these particular vegetables for a few weeks. As explained by Annals of Botany, there are plenty of leafy greens to fill the gap. And there are British seasonal vegetables we could be eating instead (although I am personally happy to leave kale for other people – I am not a kale convert). And yes, part of the answer to insulating yourself from food insecurity (which climate change is making more problematic) is to grow your own. If you sow seeds for Iceberg lettuces now you might just get a harvest before the crisis is over. There are speedier veg, but year-round self-sufficiency in salads requires time and planning. It may well be a good time to start, and VegPlotting’s 52 Week Salad Challenge will provide plenty of inspiration. But the only things that are going to make up for shortages over the next few weeks are sprouts and microgreens. The salad seeds I sowed last month haven’t got past the seedling stage yet – there’s not enough light on the windowsill. If I have a point to make (and I’m not 100% sure that I do), it’s that broadening your vegetable horizons is a worthwhile endeavour, and that lettuce really aren’t the icebergs we should be worrying about. Thanks for the mention, Emma 🙂 Like you, I struggled to find a definition of salad for the 52 Week Salad Challenge and for the purposes of that confined it to the growing and foraging of leaves to be used every which way. I’d add pea shoots to the sprouts and micrograins list as well as whatever can be foraged – my garden has a great supply of bittercress, for instance. Pea shoots turned out to be the most prolific and quick crop for these iceberg-starved times if people are looking for GYO ideas. I’m turning my attention to the likes of red cabbage and seasonal coleslaws – like you I can’t abide kale. A great question! Our definition of salad is still very narrow, really – it’s amazing how many people say “I don’t like salad” when what they mean is “I don’t like lettuce”! Right now it’s the foraged stuff that’s filling the gap for me, plus some baby kale leaves… if you can face the idea of eating violet leaves, dandelions, red valerian etc there’s actually a reasonable amount of stuff to eat. That’s predicated on a) being able to ID edible things b) living somewhere with space to forage and c) having the inclination and will to do it. The motivation is, it’s free, isn’t as time consuming as growing your own, and can be, dare I say it, fun! I agree with everything you have said! I’m a big fan of Joy Larkcom too – I have lots of her books. Salad is very hard to define, but we know it when we see it, eh? I was surprised by the list of ingredients in the 1309 salad. I hadn’t expected them to be using garlic and oil in the 14th century. I had thought of those as more modern. The Allium family is well represented! It certainly doesn’t sound like the perfect office lunch salad! The ‘fuzziness’ is sometimes a problem for me. Love the salads other people make but am less sure when selecting my own combination of ingredients! I wrote a blog about warm mallow salad on my blog once (http://backyardlarder.co.uk/2013/11/warm-mallow-salad/) and my researches suggested that the crucial thing to qualify a salad was the dressing (‘sal’ coming from Latin for salt in the brine the Romans often used for their salad dressing). That would mean one can’t ask for salad with no dressing please!